AIR GUITAR SEASON STARTS TONIGHT! Hammish Robertson of THUNDERKOK to judge the madness at the House of Targ. The competitors are lined up, the tracks are queued and ready, the THunderkok is aroused and ready to explode. Join us tonight for the first Air Guitar event of the 2017 season. It’s always a great one in Ottawa. All in support of Right To Play Canada. Sponsored by Collective Arts Brewing and Panago Pizza. UNICORNS? Why not Air Guitar? According to Twitter, Chelsea Miller, the popular Ottawa Radio DJ and Mid-Morning host is into: Radio. Giraffes. Unicorns. Ceebs. Giggles. Family. White Owls. and Sports. It’s an impressive list. We are excited to add Air Guitar Judge to it. Let’s give Chelsea a warm welcome to the madness that is competitive mime. We can’t wait to hear her radio-voice peep back some missives to our competitors as she tosses up the scores and helps us find our 2017 Ottawa Champ! See you all at the House of Targ on Saturday May 6th! BUY yer cheap advance tickets until 6pm on May 5th. Then grab them at the door. IMPROV JUDGE AT AN AIR GUITAR SHOW?? INSANITY! Welcome back to Kristine Shadid, our 3rd judge and local improv and musical comedian. She’s been studying, performing and teaching improv since 2007 and is a current member of the local troupe Crush Improv. She has performed at different improv festivals nearby (Ottawa Improv Festival, Ottawa; Combustion Festival, Toronto; Big City Improv Festival, Toronto; MPROV Festival, Montreal). Her other pet project is her comedy duo band, Rhythm and Burgundy, that she co-created with her best friend Allison Harris. They’ve performed all around Ottawa and Toronto and will be back at this year’s Ottawa Fringe Festival with the appropriately named show called ‘THE COMEBACK TOUR’. Kristine is a perfect to fit to judge the competition this Saturday because the second round (where champions are made) is highly improvised. The competitors only find out what song they perform to after the audience decides after voting by ballot that evening. We hope that Kristine is ready for the next level improv. She tells us she is very excited to watch people shred air, as it is the only instrument she genuinely knows how to play. And by instrument she means cheese grater. See ya at Targ on Saturday! MAN, OH MAN… THE CAPITAL OF GOODIES! As we near the third annual Air Guitar Ottawa Championships at the House of Targ on May 6th, we felt it important to let everyone know what riches were on the line and ready to be won. Thanks to Sandy ‘Freak-a-chu’ Gibson, we’ve got a bevy of treasures for our Air Guitarists to walk away with for the mere act of 1-minute of gyration and galavanting. It’s a small way of saying thanks for taking part and helping us raise the coin for our charity Right To Play Canada. Trip to Toronto for Nationals. Hotel for July 15th. Low Cost Travel. Collective Arts Prize Pack. Ottawa Championship Title. Infamy. Panago Pizza Night Gift Certificates. Get your Pizza ‘on’ thanks to the generous za-masters at Panago. Vice-champion title. Invitation to compete at Nationals. Industrial Italian Brasserie Gift Certificate. Get productive, nay industrious with your gourmet Italian grub. Black Squirrel Books & Espresso Gift Certificate. For all your high-octane coffee needs and bookish moments. Due to the popular demand to have a wing man/woman for the ridiculousness of Air Guitar – we have added a new round of competition called the DUETS ROUND. Find your drunkest friend and take them on stage with you and perform from any one of our pre-selected tracks. You can win the highly coveted Twin Mugs prize from the Mud Oven. NOTE: this is not an official entry into the competition… it’s like a side bet. As with all years, the audience gets to choose which song the Air Guitarist have to perform to in the 2nd round. Audience are give the opportunity to ‘Boost The Ballot’ for their choice by making an extra donation to the charity. For every ballot boosted is a chance to draw the Audience Appreciation prize: Guest Passes to Cineplex Landsdowne. So be sure to vote with a donation to Right To Play for the song you want to hear like 5-7 times that night as each competitor will perform to it in the second round. ANNOUNCING OUR 2017 PANEL OF OTTAWA JUDGES! Join us in a warm welcome to our first Ottawa judge – one of TARG’s very own – Joady MacIntosh, AKA. Lexxi Splitlip from Ottawa Punk Rock and Rollers IN HEAT. We are thrilled to have Joady sit at the table of our jury and put up some tallies for all the competitors who will be rocking like mad-people for 1-minute of Air Guitar on May 6th at the House of Targ. It’s not too late to enter and be judged by our friendly panel of music experts. Born the second of four sons to a lumberyard foreman and a surgical RN in Miramichi NB, Joady MacIntosh had no shortage of imagination nor outlets to express it. After some formative years in theatrical performance and dominating the mall lip sync circuit, he came to the Capital city to form Busboyeez in the fall of 1999. Although he had seemingly always written and preformed song acoustically, he has now gravitated to the role of the frontman. So too is his current obsession with rock n rollers IN HEAT, who have delighted audiences of punks, rockers and metal maniacs alike, as he dons the trashy garb of one Lexxi Splitlip performing lead vocals – forever referring back to his original form of self-critique: lip syncing in the mirror. Air Guitar Canada is a Not for Profit Organization rocking out for world peace and helping children facing adversity. We are the official Canadian licensee of the World Air Guitar Championships – our Canadian champion will win a trip to Finland, the home of Air Guitar, to face off against the world’s best. We donate the proceeds of our events to Right To Play, a charity dedicated to using sport and play to educate and empower children and youth to overcome the effects of poverty, conflict, and disease in disadvantaged communities world-wide. May 9th was a hot and steamy night in Bytowne… but the underground awesomeness of House of Targ kept our performers cool and ready to rock the crowd. We had 12 performers – all new to the Air Guitar thang. They strummed, chugged and twanged their invisible axes like a possessed dervish and in the end a champion was crowned. Jason ‘THRUST’ McNeely received the highest scores of the competition, punctuated by two 6.0’s in the compulsory round! THRUST will be travelling to Toronto for July 25th where he will take on other regional champs and some Dark Horse competitors for the chance to be called the 2015 Air Guitar Champion. 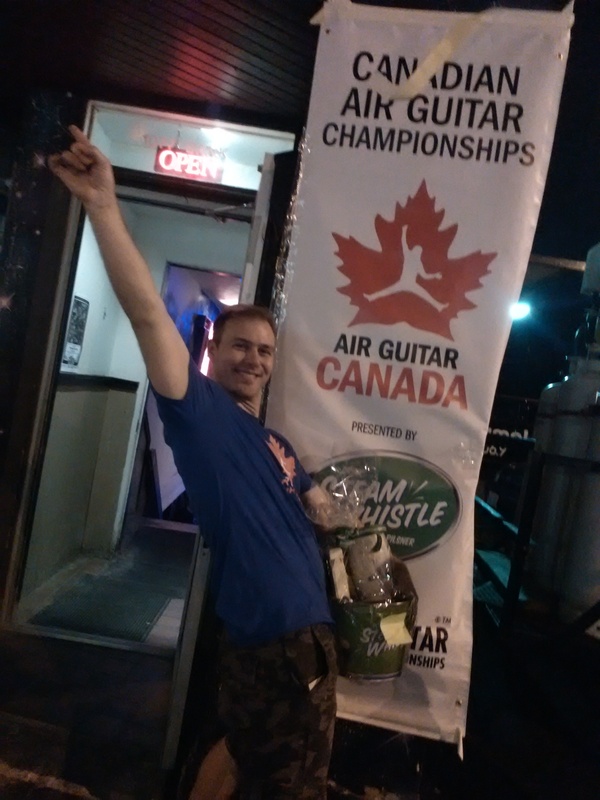 We will fly our winner to Finland for the 20th Air Guitar World Championships on Aug. 26-30th. Our next competition is Montreal on June 6th. So don’t be shy and register for that one, become the Montreal Champ and embark on your journey to out-thrust THRUST in Toronto in july. We raised $400 for Right To Play from Ottawa’s event and we’re looking forward to raising even more coin for our cause as the season progresses. HOUSE OF TARG – Yogi, Blake, Ian on Sound, Bar Staff. AUDIENCE – you know who you are. Keep on Rocking in the Free World! !